Value_Set_Name is the name of value set for a prior parameter in the same parameter window that you want your parameter to depend on. Let's say there are Vendors and each vendor has number of Purchase Orders. If we display all Vendors in the valueset of parameter1 and all PO's in parameter2 value set then it might kill lot of performance and also it will be hard for a user to select an PO's from the huge list. Better Solution is to let user select the Vendor from the Vendor Valuset first. 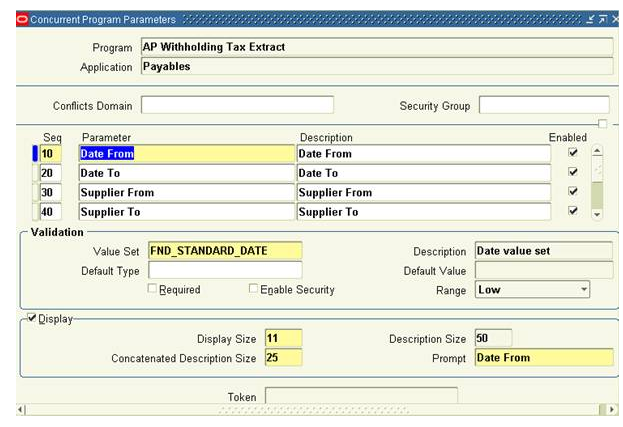 Based on the Vendor selected, you can display only the Purchase orders in parameter2 that belong to the selected Vendor in parameter1 valueset. Parameter1 and parameter2 are dependent on each other. If the user doesn’t enter directory path, there is no point in enabling the parameter2 i.e filename. In such a case, parameter should be disabled.This can be achieved using $FLEX$. 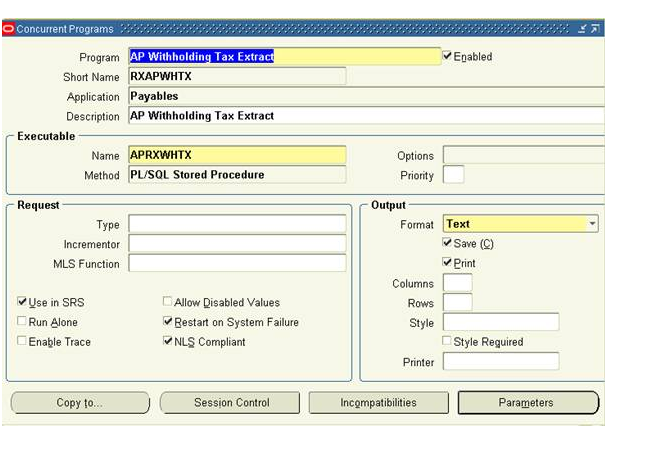 Let’s take the standard concurrent program “AP Withholding Tax Extract” to explain how to use :$FLEX$.. 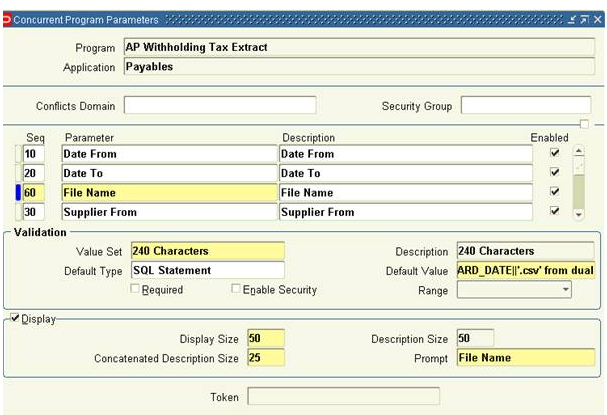 The requirement is to add an additional parameter called “File Name” where the user will give a name to the flat file where the tax extract will be written to, as a parameter. Instead of typing in the name of the file everytime you run the program, the file name should be defaulted with the value that the user provides for the parameter “Date From” plus “.csv” which is the file extension. Let us now see how this can be achieved using :$FLEX$. 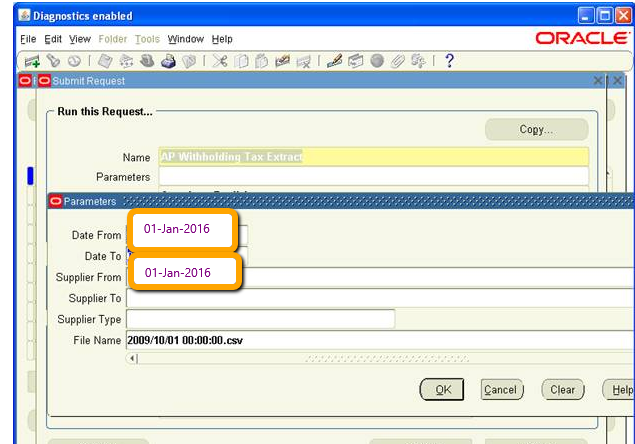 Here FND_STANDARD_DATE is the value set name of the parameter “Date From” as seen in the above screenshot. Now go to the respective responsibility and run the concurrent program. When you enter the value of “Date From” and hit tab, File Name parameter will automatically be populated as shown in the below screenshot.